Mrs. Gladys Hills, 59, 2708 Buckingham Drive, Rockford, killed Sunday, Feb 14, 1965, in a headon auto collision near Naples, Fla. Born Aril 2, 1905, in Sterling, Ill., daughter of Jacob and Jean MacFadyn Gatz. Lived seven years in Rockford, coming her from Oregon. 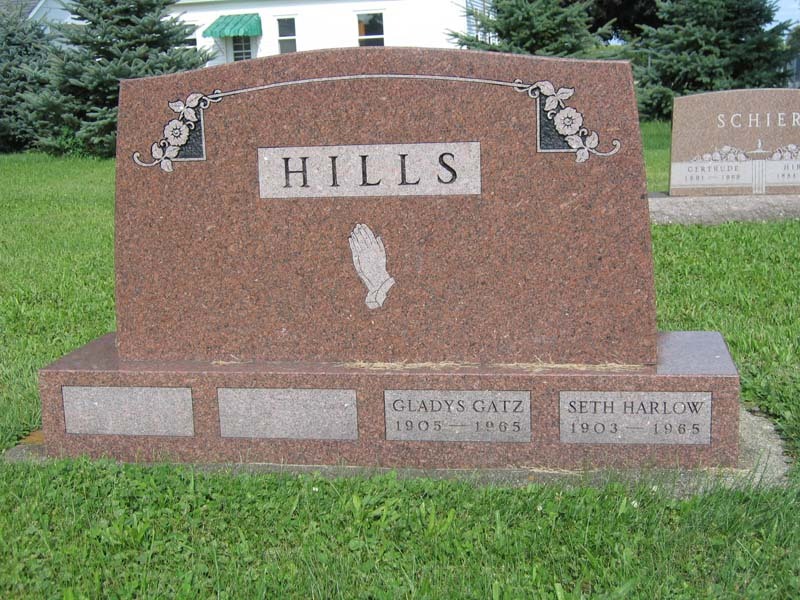 Married to S. Harlow Hills in Iowa May 26, 1928. Member of Lighthouse Methodist Church, rural Oregon, was secretary of the WSCS at Court Street Methodist Church, Rockford. Survivors include: two sons, Paul, of Rockford and Elwyn, Franklin Grove; a daughter, Mrs. John (Dorothy) Blanchard, Knoxville, Tenn.; nine grandchildren; four sisters, Mrs. William (Mildred) Anderson, LaCanada, Calif., Mrs. Lloyd (Elizabeth) Nalley, Rockford, Mrs. William (Ruth) Browitt, Aurora, Colo., and Mrs. Robert (Lois) Erwin, Albion, Neb. ; and three brothers, Donald Gatz, or Byron, and Edwin and Robert Gatz, both of Oregon. Services at 2 p.m. Friday, Feb. 19, in Lighthouse Methodist Church with the Rev. Lyle Miller, pastor, officiating. Burial in the church cemetery. Arrangements by FARRELL FUNERAL HOME, Oregon. Friends may call at the funeral home from 7 p.m. to 9 .m. Thursday. A memorial has been established in her name. (Note: Gladys's sister also killed in same accident: Mrs. Marian Peterson, 58, 1342 W. Winona St.,Chicago. Born 10/21/1906 in Sterling IL. Employed as a registered nurse.